Hearty and uninhibited, Jamal Rasheed’s laughter ricochets from honey yellow walls lined with portraits of civil rights activists. 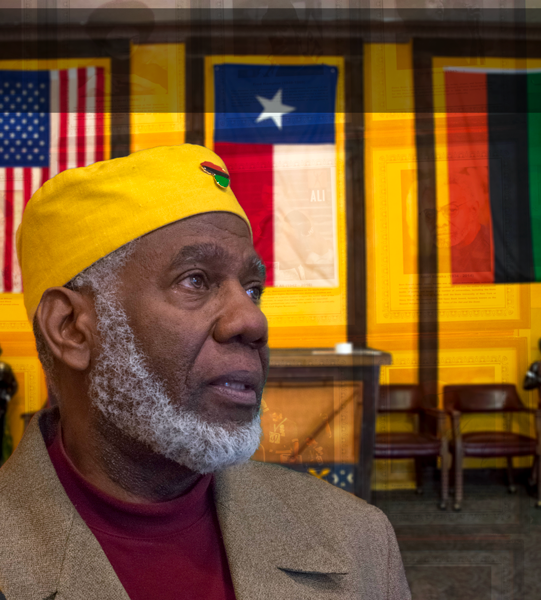 His devotion to black history is evident in every corner of the Ellis County African American Hall of Fame, where he shares stories of those who came before him, passion seeping from every syllable. Rasheed, the founder and CEO of the Hall of Fame, teaches sociology at Eastfield. Equipped with endless curiosity, a formal education and experience, he dedicates his time to sharing knowledge with anyone willing to listen. His museum is just one way he does that. The Hall of Fame tells the story of black struggles in America, focusing on civil rights movements. Rasheed also operates a cemetery for homeless African Americans. The cemetery was historically an all-black resting place because blacks could not be buried in a graveyard for whites. The Hall of Fame building itself is storied, once the meeting lodge for the Colored Knights of Pythias, a closed society and, during a period of the city’s history, the only place black students could meet to hold a prom. It was designated as a historic building in 2012 by the Waxahachie city council, three years before the Hall of Fame opened there. It was recognized in 2017 by Preservation Texas for its historic quality. “The building is identified by many older African Americans as the ‘only place in town we could have dances,” said Ellen Beasley, an architectural historian and author. Life rarely came easy for Rasheed growing up in the 1960s on the South Side of Chicago. Rasheed was 5 years old when his parents divorced and was left with a mother busy trying to make ends meet. So he spent his childhood raising himself. He became involved in gangs at a young age. The Black Panther Party was active in Rasheed’s neighborhood during that time. Finding inspiration in its 10-point platform, he turned his back on gangs and volunteered his time to the Panthers by selling newspapers that spread their message in local communities. The focus of the Black Panther movement, as outlined in the platform, included full employment for black Americans, reparations for slavery and segregation, the end to police brutality and fair access to housing and education. However, the Panthers were not without controversy. Along with a shootout involving police and two members of the party, there were reports that violence erupted within the group. In pictures, the Panthers are shown with black leather vests and Afros spilling out of black berets, often holding rifles and shotguns. This militant-like persona was stigmatized, but Rasheed said they were merely exercising their Second Amendment right. Social programs that aimed to lift black communities out of poverty were at the heart of the Black Panther movement. The Free Breakfast for Children Program fed thousands of hungry kids through the early 1970s and, according to the National Institutes of Health, the group also opened 13 free health clinics in communities across the country, serving both black and poor citizens. While working on his master’s degree at Sam Houston State, Rasheed applied and was accepted into a scholar program that gave him the opportunity to study under Coretta Scott King. Rasheed credits his teaching philosophy to this experience. 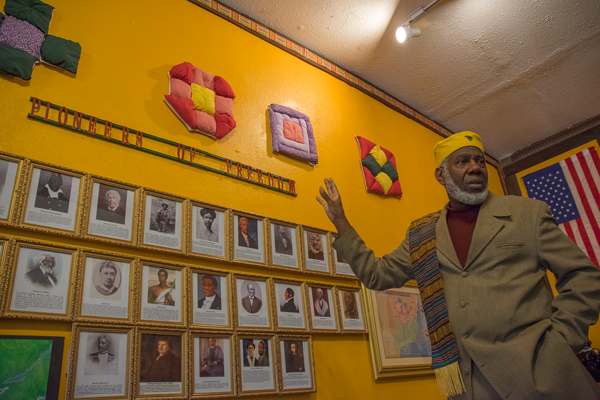 That common bond is something librarian Megan Horlander said Rasheed’s museum helps people find common ground in a community steeped in racial tensions. Rasheed was inspired to pursue a degree in sociology by civil rights activists like W.E.B. Du Bois and Martin Luther King Jr.
Rasheed tries to convey this message in his lectures. Lucaya Linwood, a student in Rasheed’s sociology class, said the way he teaches is engaging and his stories, which he tells whenever asked, add to his ability as a teacher. “The way he talks and gives us information, it’s not like a typical lecture where he just sits us down and says ‘memorize this and memorize this,’ ” Linwood said. Rasheed said he believes young people are one of the strongest assets to a civil rights movement. He said modern racial equality movements simply aren’t enough. The problem with the Black Lives Matter movement, he said, is rooted in the fact that it began as a slogan rather than by a leader. Absent a leader, the phrase is left to everyone else to define, which Rasheed points to as the cause of the confusion surrounding the campaign. Black lives are being lost not only to violent deaths by police, but to lack of access to services, Rasheed said. Looking back on the civil rights movement, Rasheed explained that protests, sit-ins and boycotts were inciting change, whereas now people protest to vent and then they fall back into the status quo. What encourages change through legislation, he said, is to affect the economy. Birmingham activists put Alabama at the forefront of efforts to integrate by refusing to use public transportation. This coordinated effort caused a large upset that local politicians couldn’t ignore. Rasheed thinks African-American history should be expanded in K-12 education, not just celebrated one month a year.